(NARRATOR)>> IF YOUR PERFORMANCE HAS GONE ASTRAY HELP IS ON THE WAY. OUR DRIVEWAY RESCUE TACKLES THIS SLUGGISH F-150. PLUS UP THE POWER AND MILEAGE ON YOUR DIESEL. THAT AND MORE RIGHT NOW ON TRUCK TECH. (JEREMY)>> EVERY NOW AND THEN IT JUST FEELS RIGHT TO VOLUNTEER YOUR SKILLS TO SOMEONE IN NEED OF HELP AND WE'RE TALKING ABOUT DRIVEWAY RESCUE. (LT)>> RECENTLY WE TRICKED OUT OUR NISSAN NV VAN WITH A WHOLE BUNCH OF TOOLS, AND EVER SINCE THEN YOU GUYS HAVE BEEN BOMBARDING OUR WEBSITE WITH YOUR SUBMISSION OF A CAR OR TRUCK THAT NEEDS SOME HELP. (JEREMY)>> CASE IN POINT, CHRIS LEE FROM BELLEVUE, TENNESSEE, AND HIS WORK TRUCK THAT HAS BEEN PARKED FOR MONTHS. (CHRIS)>> HELLO, THIS IS CHRISTOPHER LEE. THIS IS MY 2004 FORD F-150. I BOUGHT IT A COUPLE OF YEARS AGO FOR MY CUSTOM CRATING COMPANY. DROVE IT AROUND FOR A WHILE. IT STARTED TO RUN A LITTLE ROUGH. SO I TOOK IT TO A MECHANIC. HE SUGGESTED THAT IT NEEDED SOME SPARK PLUGS REPLACED. APPARENTLY THIS REQUIRES AN EXTRACTION TOOL BECAUSE IT'LL BREAK OFF IN THERE AND I'M NOT LOOKING TO HAVE A BIGGER PROBLEM THAN IT ALREADY IS. SO IT'S BEEN SITTING FOR A LITTLE WHILE. 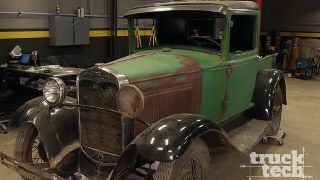 I'M HOPING WE CAN GET SOME HELP AND GET THIS BABY BACK ON THE ROAD SOON. (LT)>> SO WE CALLED HIM UP. CHRIS EXPLAINED THE ISSUES HE WAS HAVING AND WE IMMEDIATELY WENT ON TO ROCK AUTO DOT COM AND ORDERED SOME TUNE UP PARTS ALONG WITH A SPECIAL TOOL TO GET THE JOB DONE. (JEREMY)>> HEY MAN, WHAT'S UP? (CHRIS)>> NOT MUCH, JEREMY, LT, HOW Y'ALL DOING, GOOD MORNING! (LT)>> HEY CHRIS, HOW ARE YOU? SO I HEAR YOU'VE GOT A TRUCK THAT NEEDS A LITTLE BIT OF HELP HUH? (CHRIS)>> ABSOLUTELY, I BELIEVE IT'S THE SPARK PLUGS THAT KINDA NEED TO GET REPLACED. MAYBE WITH THAT EXTRACTION TOOL WE CAN GET THAT OUT. SO IT'S BEEN SITTING FOR A LITTLE WHILE. I'M HOPING TO GET HER BACK ON THE ROAD. (JEREMY)>> WELL WE BROUGHT SOME STUFF WITH US. WHY DON'T WE CHECK IT OUT? MAYBE WE CAN SEE IF WE CAN HELP YOU. (CHRIS)>> ALL RIGHT FELLAS, SO HERE SHE IS IN ALL HER GLORY. (LT)>> WELL WE SAW YOUR APPLICATION VIDEO. SOUNDS LIKE IT'S RUNNING A LITTLE BIT ROUGH. MAYBE MISFIRING? (LT)>> WELL LET'S SEE WHAT WE'RE WORKING WITH HERE. YEAH, FIVEFOUR THREE VALVE! YOU SAID IT SOUNDS LIKE IT RUNS A LITTLE BIT ROUGH, MAYBE KIND OF MISFIRES? (LT)>> WELL YOU GOT THE KEYS? CAN I START IT UP AND HEAR IT. (JEREMY)>> OH YEAH, SHE'S JUMPY. (JEREMY)>> I'LL TELL YOU WHAT. I'LL GO GRAB THE VAN AND SEE WHAT WE CAN DO. (LT)>> TAKE CARE OF IT. SO THE FORD THREE VALVE VEIGHTS HAVE A VERY BAD REPUTATION FOR BREAKING OFF SPARK PLUGS IN THE CYLINDER HEAD WHEN YOU GO TO REPLACE THEM. NOW THE PROBLEM ACTUALLY IS DUE TO THE DESIGN OF THE EXTENDED TIP. 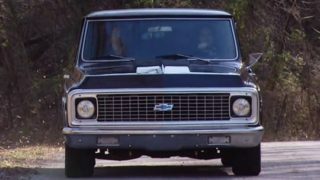 FORD ACTUALLY MADE THESE IN TWO PIECES, WHICH WAS NOT A GREAT IDEA AS IT TURNS OUT. DURING NORMAL OPERATION CARBON AND SOOT BUILDS UP BETWEEN THE TIP OF THE SPARK PLUG AND THE CYLINDER HEAD, FORMING A TIGHT BOND. SO WHEN YOU TRY AND LOOSEN THE PLUG THE NUT AND TOP SECTION OF THE PORCELAIN CAN BREAK OFF. NOW THERE ARE A FEW TRICKS THAT WE'RE GONNA TRY TO GET THESE SPARK PLUGS OUT IN ONE PIECE WITHOUT BREAKING ANYTHING AT ALL. NOW THE TRUCK DOES HAVE SOME HIGHER MILES ON IT. SO THERE IS A CHANCE THEY'VE ALREADY BEEN REPLACED AND UPDATED. SO THEY MIGHT JUST COME OUT WITH NO PROBLEMS AT ALL. BUT IF NOT, IF THEY'RE THEY ORIGINAL PLUGS, WE CAME PREPARED WITH ALL THE RIGHT TOOLS. (JEREMY)>> SO TO GIVE THIS F-150 A TUNE UP WE WENT ON TO ROCK AUTO DOT COM AND GRABBED A FEW BASIC TUNE UP PARTS, WHICH SHOULD HELP TO GET THIS TRUCK RUNNING A LITTLE BETTER AND GET EVEN BETTER FUEL MILEAGE. WE'LL START BY REPLACING THE SPARK PLUGS. INSTEAD OF USING NEW ORIGINAL STYLE TWO PIECE PLUGS WE'LL BE USING AN UPDATED ONE PIECE VERSION. THIS WILL ELIMINATE ANY FAILURE PROBLEMS IN THE FUTURE. NOT ONLY THAT, THESE ARE DOUBLE PLATINUM. SO THEY'LL HAVE A VERY LONG SERVICE LIFE. WHILE WE'RE AT IT WE'LL ALSO GO THROUGH THE REST OF THE IGNITION SYSTEM. WE'LL REPLACE THE COIL ASSEMBLIES, WHICH HAVE NEW BOOTS AND INTERNAL CONNECTOR WIRES. THEN TO TOP IT ALL OFF WE'LL REPLACE THE OTWO SENSORS IN THE EXHAUST. THESE HELP THE ENGINE MONITOR AIR/FUEL RATIO AND MAKE CHANGES FOR OPTIMAL PERFORMANCE. AND THEN JUST IN CASE WE HAVE ANY TROUBLE GETTING THOSE OLD PLUGS OUT WE ALSO PICKED UP AN EXTRACTOR TOOL. (LT)>> THE PROCESS STARTS BY REMOVING THE EIGHT COIL PACKS ONE BY ONE TO GAIN ACCESS TO THE PLUGS. I HAVEN'T FOUND ONE YET THAT'S SUPER CRACKED BUT THESE ARE DEFINITELY, THEY'VE BEEN IN THERE FOR SOME TIME. (CHRIS)>> ALL RIGHT. SO HOW DO WE GO ABOUT GETTING THESE PLUGS TAKEN OFF? (LT)>> ALL RIGHT, SO THESE ARE ACTUALLY KIND OF COOL. THERE'S A LITTLE TAB HERE. BASICALLY YOU JUST PUSH IT DOWN. CYLINDERS THREE AND FOUR ARE HARD TO GET TO. SO WE'LL HAVE CHRIS REMOVE THE COMPUTER FROM THE FIREWALL. (JEREMY)>> NOW THE NEXT THING FOR US TO DO IS TO REMOVE THOSE SPARK PLUGS, BUT WE'VE TOLD YOU HOW NOTORIOUS THE FIVE POINT FOUR THREE VALVES ARE FOR BREAKING THE PLUGS, BUT THERE ARE A COUPLE OF THINGS YOU CAN TRY TO DO TO HELP PREVENT THAT AHEAD OF TIME. ONE IS YOU CAN ADD A FUEL ADDITIVE TO YOUR TANK, RUN IT THROUGH, AND THEN IT MAY CLEAN UP SOME OF THAT CARBON AND HELP TO RELEASE THOSE SPARK PLUGS. ANOTHER THING YOU CAN TRY IS YOU CAN START THE ENGINE UP. LET IT RUN FOR A FEW MINUTES WHERE IT GETS JUST A LITTLE BIT WARM AND THAT CAN ALSO HELP RELEASE THE PLUGS, BUT I'M GONNA SHOW YOU HOW WE'RE GONNA DO IT. (NARRATOR)>> NEXT, IF THE PLUG BREAKS OFF THERE'S A TOOL FOR THAT. (JEREMY)>> WE'RE BACK ON TRUCK TECH IN THE MIDDLE OF A DRIVEWAY RESCUE WHERE WE'RE HELPING OUT CHRIS WITH HIS F-150. HE'S OWNED IT FOR THREE YEARS WHEN THE FIVE POINT FOUR THREE VALVE ENGINE STARTED GIVING HIM PROBLEMS. 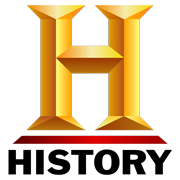 (CHRIS)>> THE MECHANIC TOLD ME THAT I NEEDED TO HAVE THE SPARK PLUGS REPLACED, AND THE PRICE WAS A LITTLE BIT TOO MUCH FROM WHAT I WANT TO DO. NORMALLY I WOULD DO THE TUNE UP MYSELF BUT I JUST DIDN'T FEEL COMFORTABLE RISKING THE CHANCE OF BREAKING THE SPARK PLUG. (LT)>> SO WITH HIS 18 MONTH OLD SON JACKSTON SUPERVISING FROM HIS BABY BENTLEY WE'RE WELL ON OUR WAY TO GETTING BOTH BOYS BACK ON THE ROAD. (JESSICA)>> HE LOVES RIDING WITH DADDY. HE ALWAYS TALKS ABOUT DADDY'S TRUCK. SO FOR HIM TO BE ABLE TO CLIMB UP IN IT AND GO ANYWHERE THEY WANT TO GO IS GONNA BE REALLY NICE. (JEREMY)>> I'LL START BY CRACKING THE PLUG LOOSE AND GO LESS THAN HALF A TURN. THEN I'LL USE SOME PENETRATING OIL, SHOOT IT DOWN THE HOLE, AND LET IT SOAK FOR A HALF HOUR. THE OIL SHOULD CREEP DOWN AND LOOSEN THE CARBON, MAKING IT EASIER TO REMOVE THE PLUGS WITHOUT BREAKING THEM. WOW, THAT IS THE TRUE SIGN OF A MISFIRE. THAT PLUG IS BAD! NASTY! WE'RE HAVING PRETTY GOOD LUCK. THE PLUGS ARE ALL COMING OUT AND WE CAN TELL THEY HAVE BEEN REPLACED AT SOME POINT. THE GOOD NEWS IS THEY DIDN'T BREAK APART IN THE CYLINDER. THAT ONE ACTUALLY LOOKS PRETTY GOOD. THIS SIDE SO FAR IS NOT TOO BAD. 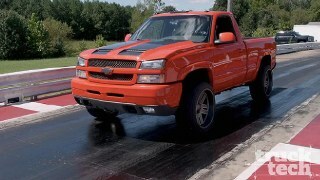 (JESSICA)>> THIS TRUCK MEANS THE WORLD TO HIM. IT HAS BEEN SITTING UNDER THAT SHED FOR SIX MONTHS AND I KNOW HE IS ECSTATIC TO GET IT DONE TODAY. (JEREMY)>> YEAH THAT ONE PROBABLY HAD A BIT OF A MISFIRE TOO. SHE'S ROUGH, BUT AT LEAST THEY ALL CAME OUT. GET SOME NEW PLUGS. (LT)>> SO THE NEW PLUGS INSTALL EASIER AND WON'T GET STUCK FOR THE NEXT TUNE UP. CHRIS WILL APPLY SOME ANTISEIZE TO THE THREADS AND TIP OF EACH PLUG. (JEREMY)>> RIGHT ON MAN, THANKS. (LT)>> YOU HAVE SEVERAL CHOICES WHEN YOU ORDER FROM ROCK AUTO DOT COM. (JEREMY)>> WE CHOSE THE OEM REPLACEMENT FOR THE IGNITION COILS, AND PREMIUM CHAMPION PLUGS FOR SPARK, BUT THEY HAD MANY BRAND OPTIONS FOR A WIDE RANGE OF BUDGETS. (LT)>> NOW WE WERE LUCKY ENOUGH THAT ALL OUR SPARK PLUGS CAME OUT IN ONE PIECE. SO WHILE CHRIS GOES AHEAD AND PUTS THE COMPUTER BACK IN THE TRUCK I WENT AHEAD AND I CUT SOME PLUGS APART TO SHOW YOU HOW THE EXTRACTION TOOL WORKS. NOW TYPICALLY WHEN THE PLUGS BREAK OFF YOU'LL BE LEFT WITH A SMALL PIECE LIKE THIS INSIDE THE CYLINDER HEAD. THE SMALL TIP THAT'S FILLED WITH PORCELAIN. SO THE FIRST STEP IS TO USE THIS PART OF THE TOOL CALLED THE PORCELAIN PUSHER. IT THREADS INTO THE SPARK PLUG AND YOU CRANK DOWN ON THIS PART, WHICH WILL ACTUALLY FORCE THE PORCELAIN FARTHER INTO THE TIP OF THE SPARK PLUG LEAVING A HOLLOWED OUT SPOT. THEN YOU'LL COME BACK WITH THIS EXTRACTION TOOL AND ACTUALLY THREAD IT INTO THE TIP OF THE SPARK PLUG. THEN YOU BACK OFF THIS NUT AND IT'LL ACTUALLY PULL THE TIP STRAIGHT FROM THE CYLINDER HEAD. (JEREMY)>> TO COMPLETE THE TUNE UP WE'RE GOING TO REPLACE THE TWO PRIMARY OTWO SENSORS LOCATED JUST BELOW THE EXHAUST MANIFOLD. (LT)>> OH THAT SOUNDED LIKE THAT COULD HAVE CUT A KNUCKLE OFF. (JEREMY)>> IT COULD HAVE. ONE THING YOU DEFINITELY WANT TO DO WHEN YOU DO THAT IS DON'T GRIP IT LIKE THAT. KEEP YOUR FINGERS OPEN AND PUSH WITH YOUR PALM, AND THAT'LL SAVE YOU FROM BUSTING YOUR KNUCKLES. ALL RIGHT, YOU GUYS READY TO FIRE IT UP? (LT)>> MAN LOOK AT THAT, SMOOTH AS SILK. (LT)>> OH MAN, SHE'S A RACE HORSE. (CHRIS)>> JEREMY, LT, IT SOUNDS WONDERFUL MAN. I APPRECIATE EVERYTHING Y'ALL DID. (LT)>> ABSOLUTELY, IT'S OUR PLEASURE. (JEREMY)>> HEY MAN, SO GLAD WE COULD HELP YOU OUT. I HOPE YOU GUYS ENJOY THE TRUCK USE IT MAN, HAVE FUN. (CHRIS)>> WE WILL. CAN'T WAIT TO GET IT BACK ON THE ROAD. (LT)>> AND IF YOU GUYS AT HOME HAVE A PROJECT THAT YOU'RE STUCK ON AND YOU WANT OUR HELP BE SURE TO GO TO POWERNATION TV DOT COM AND SIGN UP FOR DRIVEWAY RESCUE. (NARRATOR)>> NEXT, IMPROVING FUEL ECONOMY IN AN 8,500 POUND DUALLY. 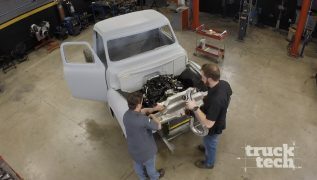 (LT)>> YOU'LL RECOGNIZE THIS RAM AS ONE OF OUR NEWEST PROJECT VEHICLES ON TRUCK TECH, AND TODAY WE'RE GONNA GET A START BY ADDING A LITTLE POWER UNDER THE HOOD, BUT FIRST WE WANTED TO GIVE YOU GUYS AN UPDATE ON A PROJECT WE'VE BEEN TESTING, HOT SHOT SECRET EVERYDAY DIESEL TREATMENT. WE ALREADY PUT THE FRTHREE FRICTION REDUCER TO THE TEST ON THE DYNO WHERE WE SAW A REAL WORLD INCREASE OF 12 HORSEPOWER AT THE WHEELS, WHICH IS A PRETTY BIG DEAL ESPECIALLY WHEN YOU CONSIDER THE POWER LOSS OF THE GIANT REAR AXLE AND SIX SPEED AUTOMATIC. TODAY WE'RE GONNA FIND OUT HOW THE COMBINATION OF FRTHREE IN THE ENGINE OIL AND EVERYDAY DIESEL TREATMENT IN THE FUEL SYSTEM HAS EFFECTED OUR MILEAGE. NOW WE RECENTLY DID SOME TESTING WITH THE TRUCK UNTREATED AND WE AVERAGED 17.2 MILES TO THE GALLON. SO LAST WEEK WE TOPPED OFF THE TRUCK WITH FUEL, ADDED SOME EDT, AND THEN WE USED THE TRUCK FOR COMMUTING AND PARTS CHASING. SO TODAY WE'RE GONNA FIND OUT WHAT OUR NEW FUEL MILEAGE AVERAGE IS. WE USED A TOTAL OF 21.8 GALLONS OF FUEL AND THE TRUCK TRAVELED 392 MILES, WHICH MEANS WE'RE NOW GETTING 17.98 MILES PER GALLON, WHICH IS REALLY GOOD ESPECIALLY CONSIDERING EVERYDAY DIESEL TREATMENT ONLY COSTS ABOUT TWO BUCKS PER FILL UP. PLUS IT'LL KEEP OUR CPTHREE INJECTION PUMP AND OUR FUEL INJECTORS RUNNING NICE AND CLEAN, AND THE INCREASED LUBRICITY IS A GREAT TOUCH. SO TO KEEP YOUR FUEL SYSTEM RUNNING AT ITS BEST USE DIESEL EXTREME EVERY SIX MONTHS AND EVERYDAY DIESEL TREATMENT EACH TIME YOU FILL UP. 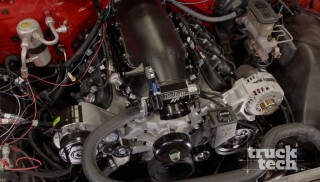 TO UNLEASH THE PERFORMANCE POTENTIAL OF THAT SIXSEVEN CUMMINS WE STARTED OUT BY GRABBING A BULLY DOG GT PERFORMANCE TUNER. LIKE ANY TUNER OR PROGRAMMER ITS BASIC JOB IS TO GET INSIDE THE ENGINE'S COMPUTER AND CHANGE THE CALIBRATION TO INCREASE POWER AND EFFICIENCY. NOW DEPENDING ON HOW WE WANT TO USE THE TUNER AND THE TRUCK, WHETHER WE'RE DAILY DRIVING, TOWING, OR JUST LOOKING TO HAVE SOME FUN, THIS CAN ADD AN ADDITIONAL 50 TO 90 HORSEPOWER, AND YOU CAN SWITCH BETWEEN THE DIFFERENT POWER LEVELS JUST BY PUSHING A BUTTON. AND THE BEST PART IS THOSE INCREASES IN POWER WILL COME AND RETAIN ALL THE FACTORY EMISSIONS COMPONENTS. NOW THIS IS MORE THAN JUST A TUNER. YOU CAN ACTUALLY USE IT AS A GAUGE MONITOR AND IT WILL READ AND CLEAR DTC CODES. 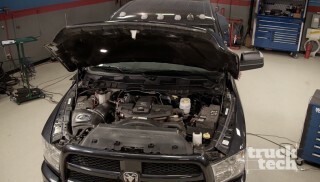 SINCE THE ENCRYPTION ON THE 2013 AND NEWER RAM TRUCKS IS JUST A LITTLE MORE DIFFICULT TO CRACK WE ALSO HAVE TO GRAB A BULLY DOG CUMMINS UNLOCK CABLE SO WE COULD FLASH THE TUNE ON THE COMPUTER. INSTALLATION STARTS BY PLUGGING THE CONNECTOR INTO THE OBD TWO PORT UNDERNEATH THE DASHBOARD AND CONNECTING THE SUPPLIED HDMI CABLE INTO THE PROGRAMMER AND THE OTHER END INTO THE INTERFACE. WITH THE IGNITION KEY TURNED TO THE RUN POSITION WE CAN START THE PROCESS. FIRST SELECT THE OPTIONS TO FIT THE TRUCK THAT YOU'RE WORKING ON, AND THE TUNER WILL FIRST SCAN THE COMPUTER AND INTERNALLY SAVE A BACK UP OF THE STOCK FILE. THEN FOLLOWING THE ON SCREEN PROMPTS, YOU'LL HAVE TO CONNECT THE UNLOCK CABLE TO A WEATHER PACK CONNECTOR IN THE ENGINE BAY RIGHT BELOW THE INTAKE, AND SWAP OUT THE OBD TWO CONNECTOR TO THE ONE PROVIDED WITH THE UNLOCK CABLE, AND CONNECT THE OTHER END, WHICH IS A MINI USB. THE GT WILL THEN BUILD A FILE THAT CAN UNLOCK THE PCM AND ALLOW CHANGES TO BE MADE. AFTER THE FILE IS CREATED THE CUMMINS UNLOCK CABLE CAN BE SWAPPED BACK TO THE STOCK HARNESS, AND THE GT FINISHES THINGS UP BY CREATING A PERFORMANCE TUNE FOR THE TRUCK AND FLASHING IT INTO THE COMPUTER. REMEMBER, WHENEVER YOU'RE FLASHING AN ENGINE'S COMPUTER AND CHANGING CALIBRATION YOU WANT TO MAKE SURE THAT YOUR BATTERY OR BATTERIES IN OUR CASE ARE FULLY CHARGED. (NARRATOR)>> NEXT, HOW TO MAKE A CUMMINS BREATHE. (LT)>> WITH THE BULLY DOG PROGRAMMER INSTALLED WE'VE GOT ANOTHER 90 HORSEPOWER ON TAP OUT OF THIS SIXSEVEN CUMMINS, BUT THAT'S GONNA MOVE A LOT MORE AIR AND THE STOCK INTAKE SYSTEM, WELL IT'S PROBABLY NOT UP TO THE TASK. SO WE NEED TO FREE UP SOME AIR FLOW, AND THERE ARE A LOT OF BENEFITS TO DOING THAT ON A DIESEL ENGINE. FROM LOWER EXHAUST GAS TEMPERATURES, TO BETTER FUEL EFFICIENCY, AND OF COURSE THE OBVIOUS ONE, MORE HORSEPOWER. THIS IS AN AFE POWER MOMENTUM HD COLD AIR INTAKE SYSTEM, AND AT ITS HEART IS THIS DRY FLOW FILTER THAT'LL FLOW 1,000 CFM OF AIR. THE FILTER SITS INSIDE THIS ONE PIECE AIR BOX THAT'LL SEAL OFF THE HOT AIR FROM THE ENGINE BAY AND ONLY DRAW IN COLD OUTSIDE AIR. NOW THE FILTER IS CONNECTED TO THE TURBO BY THIS CAD DESIGNED ONE PIECE ROTO MOLDED INTAKE TUBE. NOW THIS WHOLE SETUP FLOWS 58 PERCENT MORE AIR THAN STOCK, AND IT'LL GIVE YOU A DYNO PROVEN GAIN OF SEVEN EXTRA HORSEPOWER AND 18 POUNDS OF TORQUE. NOW THAT'LL MAKE FOR A GREAT INCREASE. SO OUR INSTALLATION STARTS BY PULLING OFF THE OLD PARTS. WITH JUST A FEW SCREWS THE STOCK LID COMES OFF EXPOSING THE FILTER. LET'S SEE HOW WELL THIS TRUCK WAS MAINTAINED. NOT THE GREATEST. THEN THE FILTER BOX COMES OUT, FOLLOWED BY THE PCV HOSE AND THE INTAKE TUBE. SO THIS GUY RIGHT HERE, JUST A BIG SILENCER TO MAKE THE TURBO QUIET. OVER AT THE TABLE THE ACTIVE AIR BOX FLAPPER IS DISCONNECTED FROM THE OLD BOX AND INSTALLED INTO THE NEW ONE. THEN THE AFE BOX SLIPS INTO THE TRUCK AND THE FILTER GOES INSIDE. THE AIR TEMP AND MASS AIR FLOW SENSORS GET TRANSFERRED INTO THE NEW TUBE, AND IT EASILY INSTALLS INTO THE ENGINE BAY, GIVING OUR CUMMINS PLENTY OF COLD AIR TO TURN INTO HORSEPOWER. (JEREMY)>> FOR YOU GUYS THAT LOVE TO WORK ON YOUR OWN TRUCKS CHECK OUT THIS COMPACT LED POD LIGHT FROM MYCHANIC. IT COMES WITH THIS MAGNETIC BASE SO YOU CAN ROTATE THE LIGHT ANYWHERE YOU NEED IT. THEY ALSO HAVE A TOOL CREEPER. THIS WAY YOU CAN MOUNT THE LIGHT, LIGHT THE BOTTOM SIDE OF YOUR TRUCK, BUT YOU ALSO HAVE A SPOT FOR YOUR TOOLS AND PARTS. NOW MYCHANIC ALSO OFFERS A DETAILING RIG. THIS COMES WITH THE STOOL, A WASH BUCKET WITH A GRIT TRAP, AND A PLACE TO MOUNT YOUR SUPPLIES. THE SEAT CAN ALSO BE REMOVED AND USED AS A KNEELING PAD. FOR MORE CHECK OUT MYCHANIC DOT COM. 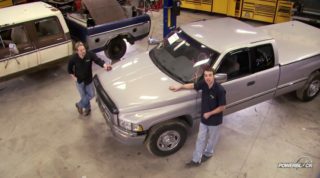 PROPER MAINTENANCE ON YOUR TRUCK IS ONE OF THE MOST IMPORTANT THINGS YOU CAN DO TO KEEP IT ON THE ROAD FOR A LOT OF MILES, LIKE CHANGING THE OIL, THE AIR FILTER, SPARK PLUGS, OR WIRES, BUT ONE THING THAT IS MOST OFTEN OVERLOOKED IS GREASING YOUR SUSPENSION AND STEERING COMPONENTS. SO TODAY I'LL SHOW YOU SOME BASIC STEPS FOR HOW TO DO THAT AND I'LL SHOW YOU SOME NEW TOOLS TO MAKE THE JOB EASIER. FIRST YOU NEED TO MAKE SURE YOU HAVE THE RIGHT TOOLS TO DO THE JOB, LIKE THIS GREASE GUN FROM LOCK AND LUBE. NOW WHEN DOING A JOB LIKE UNDER OUR F-250 I LIKE TO USE A GUN THAT HAS A LONG FLEXIBLE HOSE. THIS WILL HELP YOU TO GET INTO THOSE HARD TO REACH PLACES, BUT WHAT'S REALLY COOL ABOUT THIS GUN IS THE LOCKING COUPLER IT HAS ON THE END. I'LL TELL YOU MORE ABOUT THAT IN A LITTLE BIT. I LIKE TO TAKE A LITTLE BRAKE CLEANER AND WIPE DOWN THE FITTINGS. THIS WILL PREVENT ANY DIRT FROM PASSING THROUGH AND EITHER STOPPING UP THE FITTINGS OR RUINING THE PARTS YOUR WORKING ON. THIS IS A STANDARD GREASE COUPLER. IT SNAPS OVER THE ZIRK FITTING. IF YOU DON'T HAVE IT POSITIONED JUST RIGHT OVER THE FITTING THE GUN MAKES AN IMPROPER SEAL AND THE NEXT THING YOU KNOW YOU HAVE GREASE EVERYWHERE. LOCK AND LUBE OFFERS A SOLUTION WITH THEIR HANDS FREE GREASE COUPLER. IT HAS A UNIQUE SLIDING SLEEVE THAT IS ACTIVATED BY A THUMB LEAVER. THE SPRING'S STEEL JAWS GRAB ONTO THE ZIRK, LOCKING IT IN PLACE, PROVIDING A LEAK PROOF SEAL. SO THERE'S NO NEED TO ALIGN IT OR USE TWO HANDS. THE GREAT THING ABOUT LOCK AND LUBE IS THAT THEIR COUPLERS WILL ADAPT TO ANY GREASE GUN. NOW ONCE YOU SEE GREASE COME OUT OF YOUR PART THAT'S WHEN YOU KNOW YOU'RE DONE. BECAUSE THE LOCK AND LUBE COUPLER IS A BIT LONGER THAN A STANDARD COUPLER IT MAY NOT REACH SOME OF THOSE CONFINED FITTINGS. THIS 90 DEGREE PUSH ON GREASE ADAPTER LOCKS ONTO THE LOCK AND LUBE COUPLER. IT HAS A MUCH SMALLER PROFILE AND IT WILL SLIDE ONTO ANY FITTING, PROVIDING THE SAME LEAK FREE SEAL. 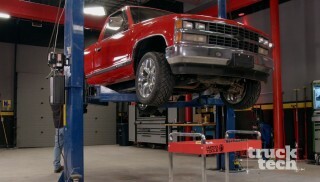 ALL RIGHT, WITH OUR OLD F-250 WE'RE WORKING ON WE REALLY DON'T HAVE ANY CONFINED AREAS THAT WE CAN'T GET TO. ALL OF THE FITTINGS ARE PRETTY MUCH RIGHT IN FRONT OF US, BUT YOU CAN SEE HOW THIS 90 DEGREE FITTING WORKS. IT JUST SLIDES RIGHT OVER THE TOP OF THE ZIRK FITTING. THIS JUST GOES TO SHOW HOW EASY IT WOULD BE TO GET TO THOSE TIGHT SPOTS. IN THE EVENT YOUR LOCK AND LUBE COUPLER STARTS TO LEAK IT COMES WITH REPLACEMENT SEAL AND JAWS, MAKING IT FULLY REBUILDABLE AND GOOD AS NEW. REMEMBER LUBRICATION OF METAL PARTS ON YOUR TRUCK IS VERY IMPORTANT TO EXTEND ITS LIFE. SO TO FIND OUT MORE ABOUT LOCK AND LUBE OR THEIR ACCESSORIES VISIT LOCK AND LUBE DOT COM. 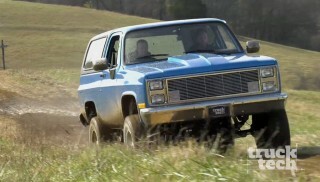 (LT)>> WE'VE MADE A PRETTY HEALTHY BUMP IN POWER OUT OF THIS CUMMINS, AND EVERYTHING WE'VE DONE IS 50 STATE LEGAL. LATER ON THIS SEASON WE'RE GONNA SHOW YOU WHAT IT TAKES TO PUMP THIS THING UP TO 650 TO 700 HORSE. 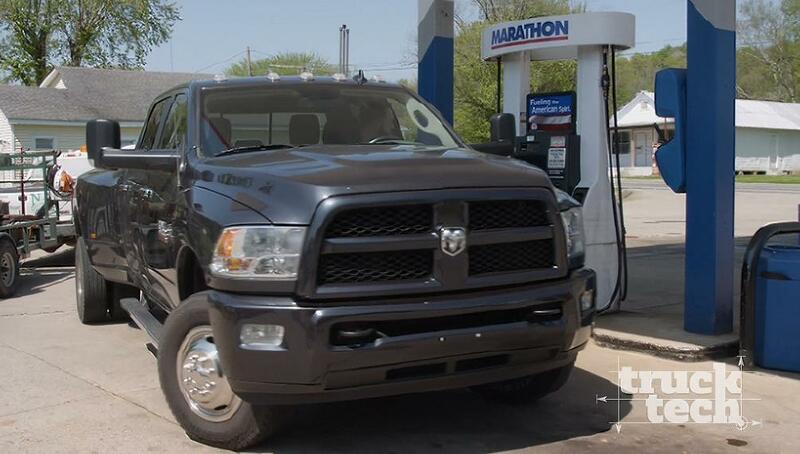 (JEREMY)>> WHICH WILL MAKE THIS BIG RAM A BLAST TO DRIVE, BUT NOT ONLY THAT WE PLAN TO ADD TO THE LOOKS OF THIS TRUCK. WE'RE GONNA MAKE THIS BABY LOOK MEAN. 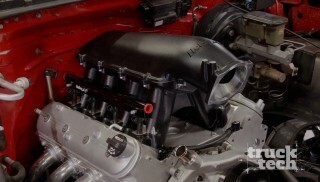 SO TO FIND OUT MORE ABOUT ANY OF OUR BUILDS CHECK OUT POWERNATION TV DOT COM. (JEREMY)>> DON'T PUT THAT ON ME. YOU KNOW YOU WANT THOSE LIGHTS. I DON'T WANT THEM.